In Gilead Marilynne Robinson writes, "This is an interesting planet. It deserves all the attention you can give it." Photographers for 177 years, and painters for centuries, have been faced with deciding what to include and exclude in the boundaries of a frame. Curation occurs peering into a viewfinder frame, or when applying pigment to a canvas. Anything can be separated, can be made discontinuous, from anything else: all that is necessary is to frame the subject differently. In an initial period, Photography, in order to surprise, photographs the notable; but soon, by a familiar reversal, it decrees notable whatever it photographs. The mundane becomes notable, perhaps glorified, simply by our devoting our attention to it. American painter William Bradford, alongside photographers John L. Dunmore and George Critcherson, embarked on the first expedition to the Arctic devoted principally to art. 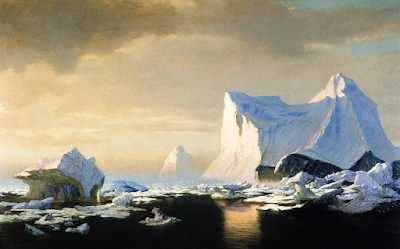 In the course of the perilous journey aboard a 325-ton steamship called The Panther (previously used for seal-hunting), Bradford made hundreds of pencil drawings and over 70 oil sketches of the frozen North in preparation for the larger paintings he would complete upon his return. ... he captures how uniquely dark Arctic waters can be. 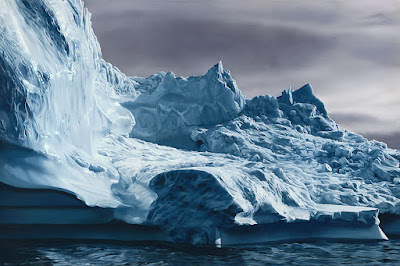 To me, many of his Arctic paintings seem to embody a sense of sadness and solemnity, as if somehow, even amidst the expansionist optimism of his age, he sensed the Arctic’s fate, as time marches inexorably forward, threatening not only the beauty but also the very existence of the ancient landscape and its inhabitants. Forman sailed up the northwest coast of Greenland in the summer of 2012 to retrace Bradford's 1869 voyage. Comparing images from her journey to photographs taken during Bradford's, Forman observed the changes in the coastal landscape. Forman has documented the rapidly changing arctic landscape in stunning pastels of icebergs. Art is always the replacement of indifference by attention. Camera Lucida: Reflections on Photography, Roland Barthes. Zaria Forman on William Bradford, 21 March 2016, Painters on Painting.